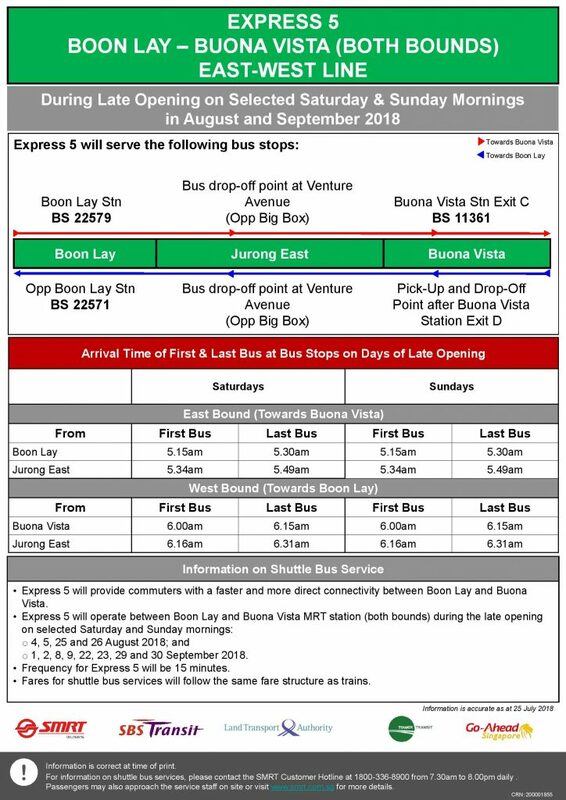 Express 5, or the Boon Lay—Buona Vista Express Shuttle Bus Service, is a Rail Replacement Service plying between Boon Lay and Buona Vista, serving major transport nodes along the East West Line (EWL). The route will be activated to operate during selected Saturdays and Sundays in August & September 2018, when shortened operating hours are implemented on the North South & East West Line to facilitate more time for track maintenance and renewal work. This service does not operate during MRT Early Closures. The Express Shuttle Bus Service will only operate on affected Saturdays and Sundays in August & September 2018, during late opening. 10 – 12 Aug, 17 – 19 Aug & 14 – 16 Sep.
buses will operate only at the stipulated first bus timings below. To speed up implementation of the new CBTC signalling system, shortened operating hours were implemented across sections of the NSL and EWL between Tuas Link—Outram Park (EWL), and Jurong East—Choa Chu Kang (NSL), across various Fridays, Saturdays and Sundays on December 2017. A total of 19 NSL and EWL stations were affected by the delayed train service start times. 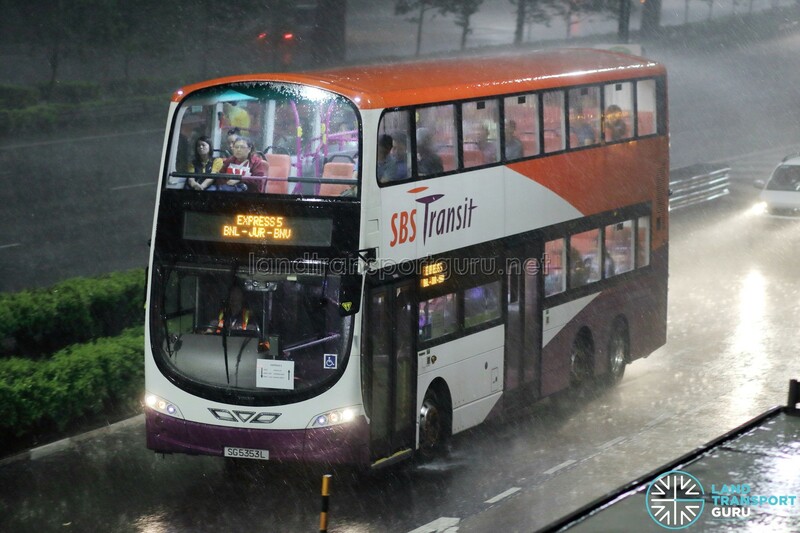 Northbound services from Choa Chu Kang and Eastbound services from Outram Park were not affected. Circle Line services from Buona Vista were also not affected. The route is one of five Rail Replacement Services during the period of closure as well as the only Express shuttle service. The other routes are the Outram Park—Jurong East, Jurong East—Joo Koon, Joo Koon—Tuas Link and Jurong East—Choa Chu Kang routes, which call at all en-route stations. Bus stops served by the Express Shuttle are identical to those served by the regular EWL Bridging Bus. To speed up implementation of the new CBTC signalling system, shortened operating hours were implemented on the East West Line between Pasir Ris—Tuas Link, and Tanah Merah—Changi Airport, across various Fridays, Saturdays and Sundays on March & April 2018, and additionally, Extended Early Closures on 12 & 14 March. The route is one of ten Rail Replacement Services during the period of closure. Bus stops served are similar to those served by the regular EWL Bridging Bus, with some changes. 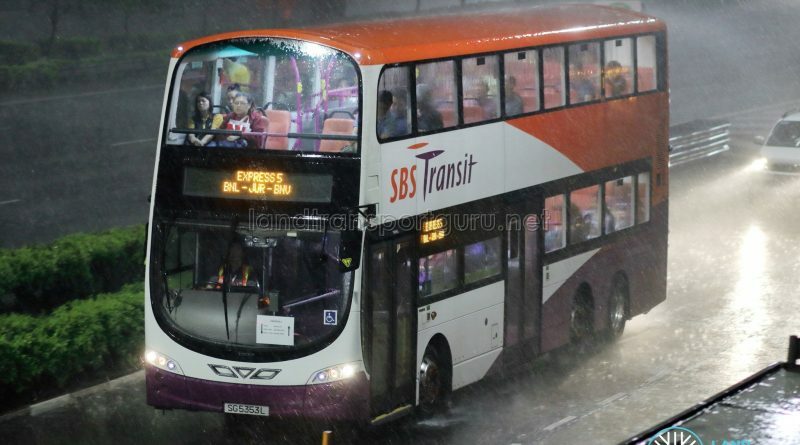 The route only operated 2 trips in each direction in the morning, at 5:15am and 5:30am from Boon Lay, as well as 6:15am and 6:30am from Outram Park. To facilitate additional engineering hours for track maintenance and renewal works, shortened operating hours were implemented on the East West Line & North South Line between Dover—Pioneer, and Bukit Gombak—Jurong East, across selected Fridays, Saturdays and Sundays on August & September 2018. A total of 10 North South & East West Line stations were affected by the early train service end times and delayed train service start times. The route is one of three Rail Replacement Services during the period of closure. Bus stops served are similar to those served by the regular bridging bus service, with some changes. Shuttle bus 5 express from BoonLay to Bouna Vista only in the early hrs n only twice? Can the express service operate throughout the late opening Saturdays ?